I’ve wanted to do a bottle vs. can blind tasting for a while now. There’s always just too much beer in my fridge to justify buying a four pack of London Pride though, so it hasn’t happened. The benefits of cans over glass are numerous: they’re less permeable to oxygen, they offer better protection against light strike, they’re easier to store and transport and they chill faster. But do they affect the way a beer tastes? And, if so, how? 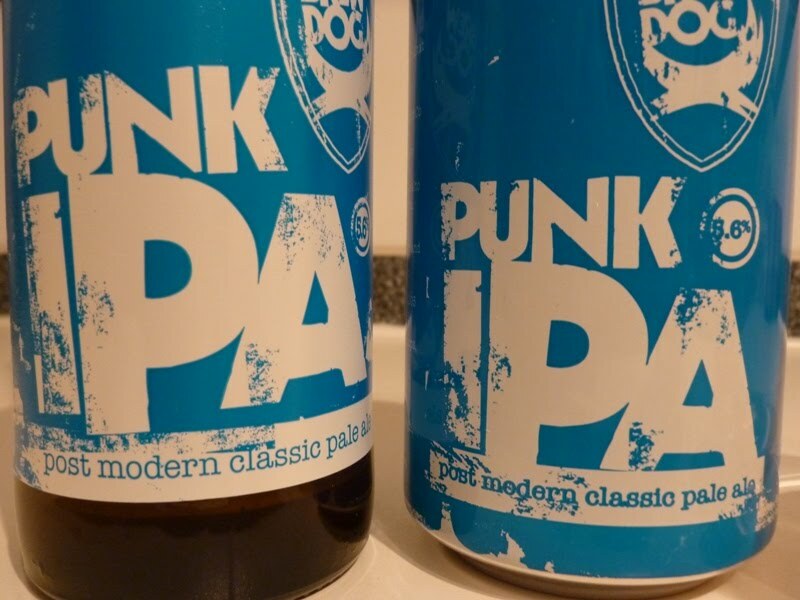 With the change to their Punk IPA recipe (that I wrote about here), Brewdog also introduced the beer in 330ml cans. I bought a bottle and a can shortly after the new recipe was brewed, so I’ve assumed that the beer is either the same batch or from two batches that were made very closely together. Each had the same storage from the moment it entered my hands; back of the fridge away from any temperature fluctuations or bright light. I turn my back whilst a lovely assistant* pours the two beers into identical glasses, labelling at random “beer one” and “beer two”. Beer number one had a fluffier, more persistent head. The aroma felt like it was lacking something over the initial test batches of new Punk though. Those hops were there, sure, bringing citrus aromas and tropical fruits, but they felt dull and tamed. Mickey Rourke as Randy The Ram - they felt like they’d lost their edge. And the same was true for the taste, a more dominant wave of chewy malt sweetness quickly rushing in after a limp initial hop attack. Bummer, not what I was hoping for at all. A delicious beer in its own right, but not what I wanted from new Punk and certainly not what I remember from those early teaser batches. In contrast, beer number two felt flatter and softer, less carbonation, a much smaller head that quickly disappeared after pouring. But we don’t judge a book, or a beer, by its cover; the aroma of this sample being worlds apart from the first. A plume of citrus-driven hop aroma meeting you from the glass, far more impactful and assertive than the first. That chewy, toffee, caramel malt backbone beaten into submission by the hops; you could pick it from the background but it felt like a canvas for those hops to be painted over, rather than a dominant flavour character. So then, clearly one beer at the peak of freshness and one on the decline. How much can be put down to those factors outside of the closure method? Age, batch, storage before leaving the brewery and whilst in transit. Who knows? Short of visiting the brewery and drinking straight off the production line, it's difficult to recreate a fairer test than the one I carried out here. Whilst not definitive, hopefully it does give some insight into the can vs bottle debate. And the big reveal ...... beer one: bottle, beer two: can. *Girlfriend coaxed into it during a Dancing on Ice advert break. While my jaw is getting acquainted with the floor - have you any plans to do more of these tests with other beers? Yeah, I agree that doing this over a wider number of beers would be a great idea! I will definetly be on the look out for single cans of stuff that I can also get in a bottle, just to do the comparison again though. The other issue comes in being sure that it's the same recipe that goes into each container. It's difficult to do a perfect test, but after doing this one with Punk ... I know I would pick can over bottle if forced to make the decision. Wait, do you mean glass itself is permeable to oxygen, or the crown cap? I've never read anything that said glass allows oxygen or anything else through (except light), unlike plastics. Yep, I mean through capping.